A new YouTube video shows the Suzuki Burgman Street recording a speedometer indicated top-speed of 100 kph, courtesy of YouTuber Dino’s Vault. The Burgman Street will launch in India on 19 July. IAB shares this video to update readers on the upcoming vehicle and in no way promotes over-speeding. We request readers to follow local speed laws. We reported on 12 July that the Suzuki Burgman Street is likely to cost INR 71,938 (ex-showroom Mumbai), according to potential customers. Bookings for the maxi-scooter are open at Suzuki dealerships at an initial amount of INR 5,000. The two-wheeler has started arriving at dealerships, as we recently spotted the matte grey paint scheme of the Burgman Street. Suzuki will start deliveries of the scooter post 19 July once the company releases the price. The Suzuki Burgman Street will come in three paint schemes –Matte Grey, Pearl White and Black. 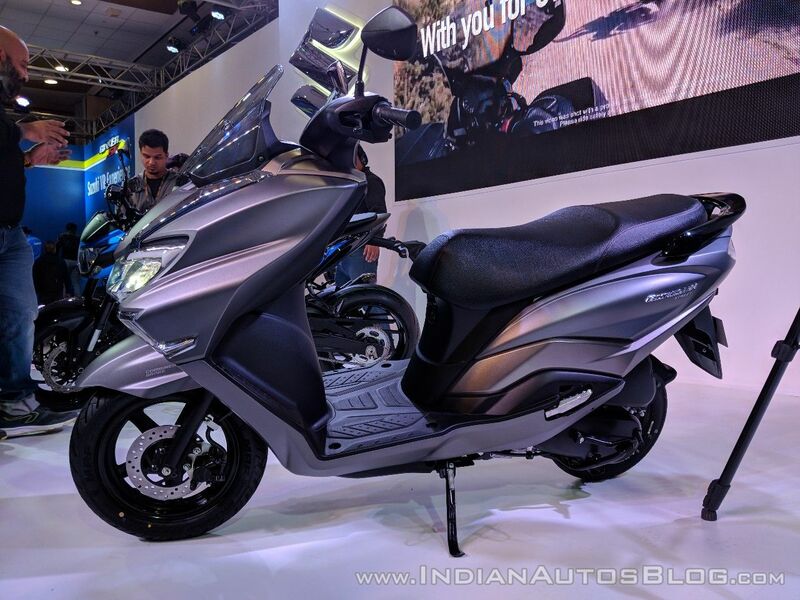 Suzuki first showcased the maxi-scooter at the Auto Expo 2018, alongside the flagship Burgman 650. The Suzuki Burgman Street will rival the Honda Grazia, Aprilia SR 125 and TVS Ntorq 125, while the company will position it above the Suzuki Access 125. The Burgman Street receives a bulbous yet sporty fairing, a high-set visor, wide handlebars and a spacious & comfortable seat. The maxi-scooter features an all-digital instrument cluster, all-around LED lighting, 12V Smartphone charging socket, and a multi-function key slot. The Burgman Street gets 21.5 litres of under-seat storage capacity. Powering the Suzuki Burgman Street is a 124.3 cc, single-cylinder, 2-valve engine that pairs to a CVT. This motor pumps out 8.4 bhp of maximum power at 6,500 rpm while developing 10.2 Nm of peak torque at 5,000 rpm. The Burgman Street gets a fuel tank capacity of 5.6 litres, while the kerb weight stands at 110 kg. The Suzuki Burgman Street will come in three colours. Braking power on the Suzuki Burgman Street comes from a disc brake at the front and a rear drum brake, with CBS (combined braking system) as standard. Suspension components include telescopic forks at the front and an adjustable mono-shock at the rear. The maxi-scooter rides on 12-inch front and 10-inch rear alloy wheels with 90-section tubeless tires.